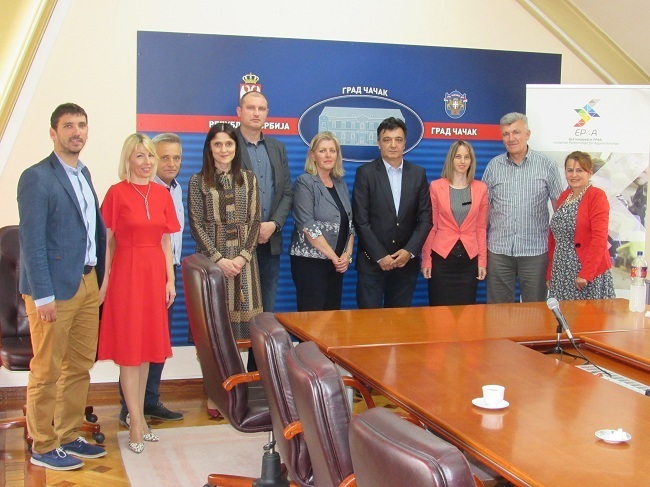 On 15 May 2018, Memorandum of Understanding on Apprenticeship Partnership Formation was signed between the City of Čačak, the Chamber of Commerce and Industry Serbia – Regional Chamber of Moravice and Raška Administrative Districts, Secondary School for Economics, Secondary School for Engineering and Traffic and two enterprises from Čačak, P.S. Fashion and Tiffany, which marks the continuation of cooperation on activities within the Erasmus+ project “Get Involved in EP4A: European Partnerships for Apprenticeships”. Mr Zvonko Tufegdžić, the director of Regional Chamber of Moravice and Raška Administrative Districts, emphasized that the City of Čačak has provided the biggest support to the economy and helped enterprises and secondary schools in the region, which has been the significant reason to sign the Memorandum of Understanding in Čačak. In this way, the more serious cooperation between schools and enterprises is established, while local authorities will continue to participate in financing transportation costs for students, and the Regional Chamber will provide support in further networking between schools and enterprises. Ms Milica Dačić, the Deputy Mayor, emphasized that the City of Čačak tries to support all current tendencies in accordance with the national level policies and which are under the authority of Ministry of Science, Education and Technological Development. She pointed out that the concept of dual education, which existed earlier only as an idea, now requires different approach since the Law has been voted. Students, besides theoretical knowledge, need to experience real life situations through work and practical skills and to develop themselves further. Mr Ivan Radovanović, the financial director of P.S. Fashion, said that company’s managing board has been satisfied with the development of 15 students from the Secondary School for Engineering and Traffic, who have enrolled in occupational profile for fashion tailors and that they will continue their cooperation in school year 2018/19. Next Apprenticeship Partnership meeting will be held on 31 May 2018 in Čačak.